Chances are that you do attend or you will attend a lot of conferences throughout your life. That’s what learners do. But we want to DO something with the information we learn, or these conferences become nothing more than ways to fill our time, right? 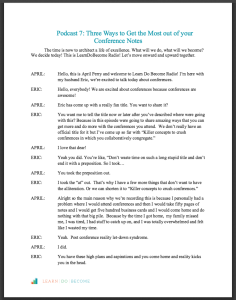 So, life architects, this podcast (and the basic outline below) will walk you through three simple ideas that will help every conference you attend to have a positive impact on your life. Idea #1: Go with questions. Before you even get to the conference, write down 3-5 specific questions you would love to have answered during the event. These questions will guide you and will have a greater impact than you might think. 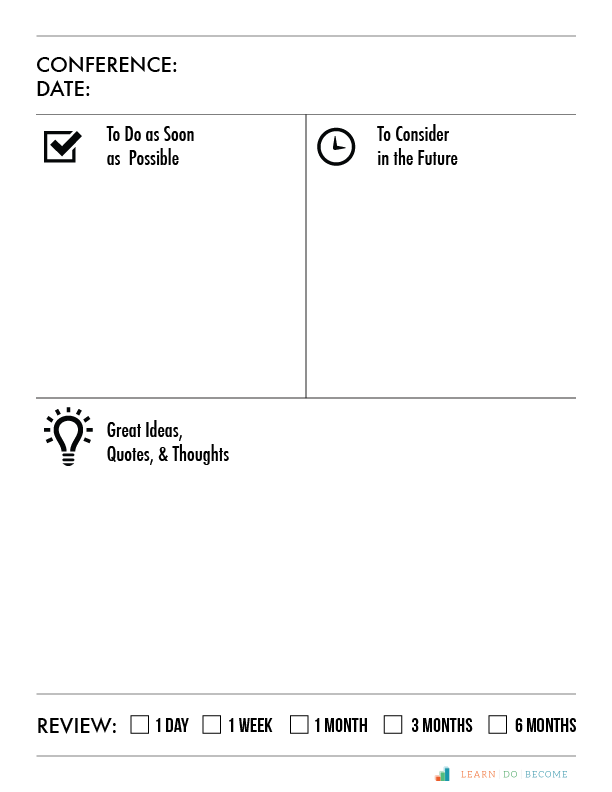 Idea #2: Use symbols in your notes. 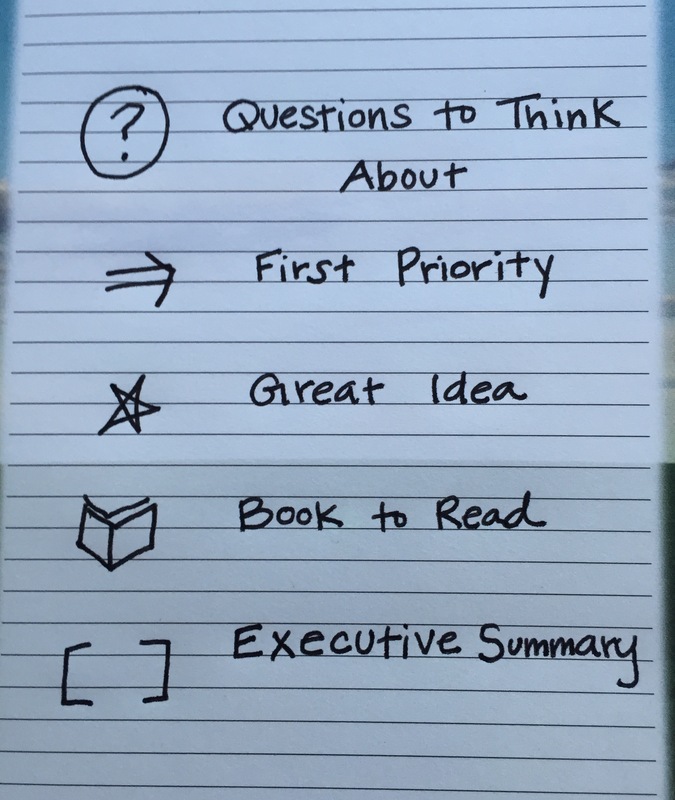 As you’re recording thoughts and ideas, add easy-to-find symbols into your notes so you can pull out the most important information once the conference is over. These can be done digitally or on paper, but here are five suggestions (we describe them more in the podcast). Idea #3: Create a one-page sheet with your key takeaways. You will definitely want to keep all your notes (Evernote is perfect for storing them digitally! ), but it is incredibly helpful to distill your notes into one page, with the action items at the very top. Then you set calendar triggers to review these notes after a day, a week, a month, etc. This is what you will implement first. Makes it easy to get the most out of a conference, don’t you think? You’re investing time and energy (and often financial resources) just to be there. These are three ways you can make that investment really matter. There’s a link above to download your own printable note-taking template, or you can make your own! Either way, we want to hear how your next conference experience goes. We’re hoping it’s awesome. Download our free guide: Five Life-Changing Habits Most People Overlook. Great ideas! I’m a stay-at-home mom who loves learning from webinars and podcasts. I like taking notes on these, but then I rarely look at them again. I’m going to gather notes from webinars/podcasts on similar topics, call it a conference, and use these ideas! 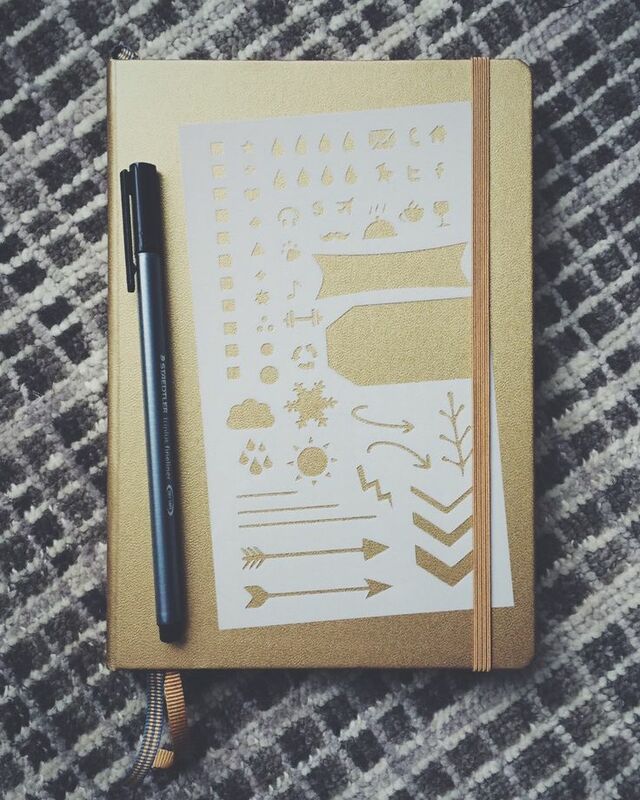 I thought of this bullet journal stencil picture when you talked about the symbols you use in your notes. Thank you- this is just what I needed. Glad to have checkd out your site. I have been to 4 conferences in the past 3 months (not typical) and I have pages and pages of notes. I will go back through my notes to create the master action plan, upload it plus a picture of the notes online for safekeeping, and then schedule time to review the plan on a regular basis. I wonder how to keep the action plan realistic when there is so much that is good to know (and to share)? I don’t really have a specific focus but rather general interests in which over time I have narrowed…. but not quite sure how to make a specific brand for yourself. I see my comment has changed direction here! Sorry! I know of you, April, from the Power of Moms but today I realize that you and your husband run this site. Is there another podcast that talks about how you decided this specific focus is what you were and are going to do? Thanks! I have just found your site and am really enjoying what I have read and listened to so far. I like your idea of a one page summary from conferences and plan to put this into practice then next time I go to a conference or seminar. I’m also thinking how I can apply it to podcasts and blog posts which inspire me and I make a few notes from. This podcast reminds me of a talk I heard from ‘The Brain Guy’ Terry Small http://www.terrysmall.com/ in which he said that if you make handwritten notes during a talk (or lecture/sermon etc. ), you will remember a much greater percentage of what you heard, even if you never look at them again. Of course, if you do review the notes then your retention goes up so much more. So your one page summary and then reviewing of the summary will improve your retention of what was spoken as well as giving you the opportunity to put into practice the action points you set yourself. Thank you for putting these podcasts and blog posts together. I enjoy the conversational style between husband and wife. Angela, this is AWESOME. Love this information, and I look forward to checking out Terry’s podcast! Thanks for being with us and for your kind words. They mean so much! Thank you for your reply. I should clarify that I heard Terry Small speaking live a few years ago. He also said that we remember much more if we take notes by hand than electronically. Unfortunately I don’t think he has a podcast, but he does have a blog with interesting posts on your brain and ways to improve how you use it. The concept of the executive summary reminds me of what my son’s piano teacher wants him to do: when he goes home from a lesson, he needs to practice everything he just went over in his lesson because he will learn and retain what he has learned faster and better. Great podcast!! Yes! Such a great parallel! Thank you so much, Dana! This literally has helped me through DOZENS of conferences. 🙂 Hope you can utilize it in the future! Thank you for this information and tool for all those NOTES! Do you have a suggestion for incorporating photos that I take of powerpoint presentations during the conference, or video’s even? I typically come home with information in an array of formats. Handwritten notes, photos of powerpoint presentations, videos and even audios . I’ve never been able to come up with a solution for having them all in one place. I have never tried to put photos/videos/audios in Evernote, is it possible? Hi JoAnn! You can add photos/video/audio in Evernote. 🙂 You may be limited by account restrictions depending on which account you have – free vs paid – but it can be done. A quick Google search pulls up lots of tutorials. Evernote is amazing!